How Screencasts Help Improving Customer Retention - Atomi Systems, Inc. It is 6 – 7 times more expensive to get a new customer than to keep a current one. A 5% increase in customer retention makes profits rise up to 125%. A 2% increase in customer retention has the same effect as reducing costs by 10%. With those in mind, there is no doubt that every business needs to take a proactive approach to customer retention. But working in the customer service industry is a tough job. It involves understanding what customers want, knowing when they want it, and giving the perfect solutions to their problems at the right time. So, how can screencasts help you increase your customer lifetime value and loyalty? Here are two convincing answers. Remember that not only to get new customers, but far more difficult still, to keep existing customers. In the article published on Forbes, the author Micah Solomon also emphasized that “No matter how loyal they are, some of them will leave your business from time to time, even never return. It is a part of the changeable human condition.” We cannot do anything against this truth but improving customer service. One of the big reasons why you lose existing customers is that you cannot keep up with changes in customer needs such as speed, time flexibility, and quality. For example, while your competitor creates video tutorial series to support customers, you still provide technical support only over the phone and through email. If you resist changing the way of communication with customers, how could you maintain the relationship with them and improve your sales? Even though your quality has stayed the same, the game has changed. To overcome this challenge, you need to take a serious look at using screencasts in customer support. Gone are the days when you sent emails to customers with full of text or answered phone calls for hours. You now just use a screencasting tool like ActivePresenter to record screen just one time, and you will save yourself a great deal of time and effort, even if thousands of customers need a problem solved at the same time. As a customer service officer, you will receive a lot of emails each day. Many of the question entries are the same, and you have other things to deal with. So, let screencasting tools help you reduce work overload and deliver excellent customer service. Social media plays an increasingly important role in the customer service strategy of many companies. Conversations can involve anything from solving common issues, explaining complex ideas/features to introducing new how-to video tutorial series. If you have a business page (Facebook, Twitter, LinkedIn, etc.) with thousands of fans and followers, read on how to use screencasts to improve their experience. This way will also help you keep your existing customers and get more new ones. The image below is the screenshot (taken with ActivePresenter) of a Facebook post. 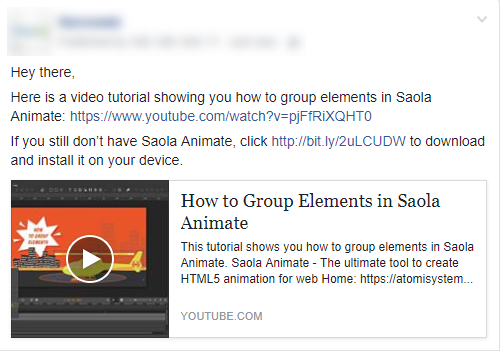 This post mentioned a video tutorial which answered a question of many users when using Saola Animate: “How to group elements?”. As you can see, the post became shorter with an attached video link instead of too much text, making easier for customers to digest information and save the screencast for re-watching later. Recording screen is especially practical in case you have a Twitter business page. Because this social platform limits 140 characters for each tweet, creating a screencast to guide customers through solutions to their problems is a great choice. Complex ideas are not easily accepted all the time, especially when customers become familiar with simple things. According to Dr. Emily Grossman, an expert in molecular biology and genetics, “when trying to explain complex information to an audience, the first task is to get the content of what you’re saying right, but how we communicate is also crucial.” This contributes to the fact that screencasts are more outstanding than email and phone calls in providing new and/or complex information for customers. Screencasts can be used for describing a step-by-step process, explaining a particular concept/idea, or presenting a PowerPoint presentation with narration and multimedia elements. They will bring you a lot of advantages in delivering the high-quality customer service. Customers are willing to pay more for a better experience, don’t forget that! Download ActivePresenter today, and create your own videos. Known as one of the best screencasting, video editing, and eLearning authoring tool in the market, ActivePresenter will make you love your customer service job much more.